A special little keepsake for a couple on their Anniversary. 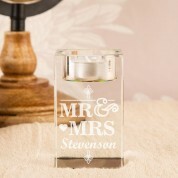 Alternatively it would make a brilliant Wedding gift. 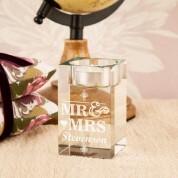 Our engraved design compliments the rainbow effect glass block which simply reads “Mr and Mrs” and the couples surname. 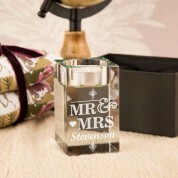 Regal motifs and a love heart completes the simplistic design. This would look stunning when holding a lit candle in a couples new home - on the mantelpiece or on a table when guests are round . A one of a kind gift ideas for special couples of any age.